When Shoebox NY approached us back in March this year, we jumped at the chance to work on a retail design identity for the highly regarded brand. And after working in Kuwait previously, we were more than happy to take on another project of the same calibre. Now, we can reveal more of the D4R x Shoebox story! A family owned business, established way back in 1954, Shoebox stood alone as a single store in Long Island. Since the mid-fifties, they've expanded their physical retail presence across the USA and Middle East. And as part of their latest retail strategy, they wanted to open a newly designed store in Kuwait's 360 Mall. Enter, D4R. Similar to some of our projects but also with its own quirks, we were excited to get our hands onto the Shoebox brief and really delve into the design opportunities for the acclaimed brand. Accounting for not only their brand identity, but also retail expectations in Kuwait, the project encompassed a great deal of considerations. Firstly, brand considerations. Shoebox are committed to fashion and maintain a roster of high-quality brands in their stores; often introducing new lines to customers through suggestion and presentation. Customers can be confident in their purchase from the brand and it is this trust, quality and reliability which must be communicated in-store. Secondly, Kuwait shopping expectations. Malls are instrumental when it comes to Middle East retail, they offer more than just a shopping encounter, they are an experience. With the prospect of lengthy dwell time in malls, stores must offer an experience to rival this. Taking both considerations and expectations in our stride, we designed a beautiful retail space for Shoebox NY which appealed to all aspects of the shopping experience. Starting from the outside, we opened up the front of the store with sheer glass windows; creating an impactful visual into the stunning interiors. Stepping inside the store, the feminine but robust store design becomes clearer. Throughout the installation process we had a brief guideline as to where furniture and fixtures were to be placed; not limiting our creative vision when it came to overall retail identity. Both D4R and the Shoebox ambassadors wanted the space to be clean, clear and bright. But it is the premium nature of marble-backed fixtures, custom made dusky pink sofa and quality unitary which really exudes the quality of the displayed brands. 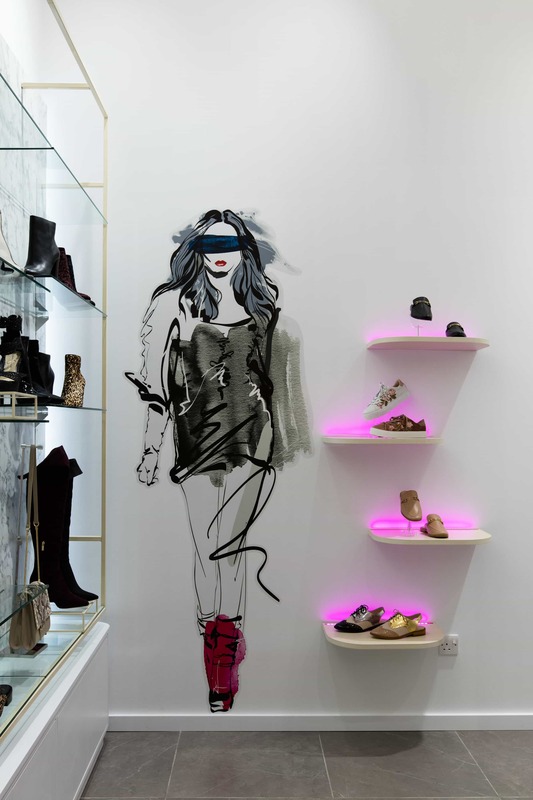 Combined with the vivid Shoebox' neon sign and shelf toppers, sassy hand-drawn women and floor length feature mirror; this store takes premium to a playful level. The wall water colour effect drawing illustrations add such a creative design to the whole store, it gives it that extra personality. This combined with the dwell nature of the comfy sofa for trying on shoes really appeals to the nature of shopping in a Kuwait mall. 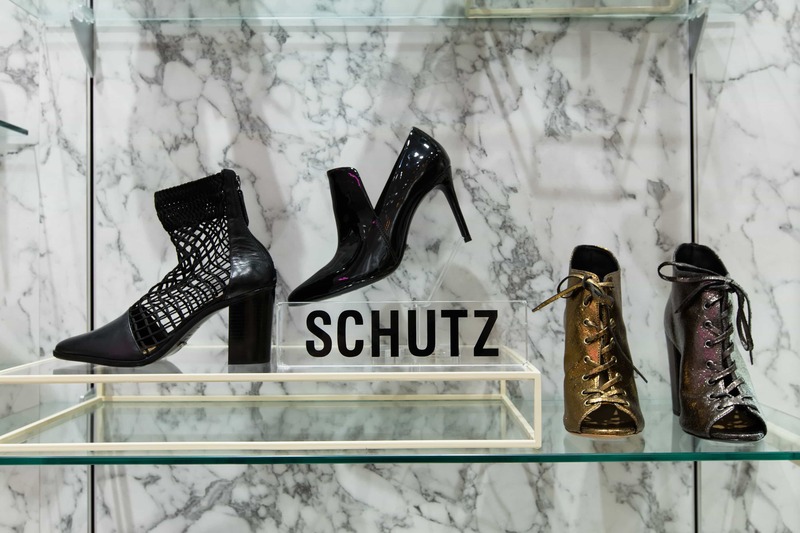 Whilst the product displays are simple, the placement at a variety of angles manages to elevate the shoe and call out products in an effective manner. We love to talk about this project, so feel free to ask us more!